If you retire at 65, retirement could easily last three decades and that can be a scary thought for some. Instead of accumulating wealth during your working years you will now see your retirement savings you worked so hard for begin to diminish. We will review some guidelines and thoughts on ways to help identify your income streams and applying those to your expenses during retirement. Are you eligible for a pension or other guaranteed benefits? 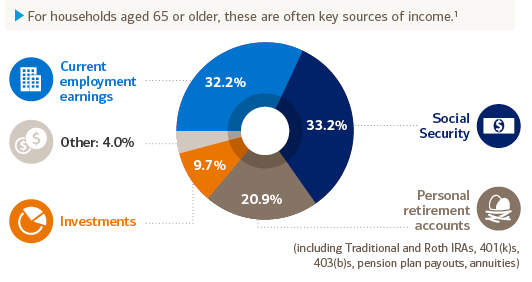 Pensions are not as common this day in age but can be a great benefit to help fill the expense gap during retirement. Can you continue to earn income by working part-time? Working can help you delay drawing income from Social Security and your savings. Can you live on sources besides Social Security for your early retirement years? For every month you delay collecting after age 62, your benefit grows. Do you have property that can generate income? For example, you may want to rent out a vacation home when you're not using it. All of these are sources of income that can help during retirement, not just the amount you personally saved and invested on your own. An added benefit that many rely on is Social Security and as stated above the longer you wait to withdrawal the more you will receive. The goal of developing a retirement income strategy is to understand where your income is coming from and how that income will be allocated to pay your expenses. 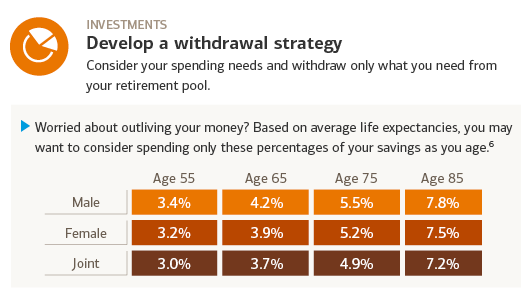 The less you can use of your retirement accounts (401(k)/403(b)/IRA) the better probability you have of having sufficient money to last the duration of your retirement. That is the important gap that needs to be focused on. What expenses are left after you have used your income outside of my retirement account(s)? $3,000 is the income gap that will help us decide our withdrawal rate and risk tolerance necessary to properly fund retirement. Without knowing these variables retirees can invest too conservatively or take extra risk that may not be necessary. It is imperative to have a strategy when entering your retirement years. Hope is not a strategy. “I hope I don’t run out of money.” “I hope I can afford to travel and still not outlive my money.” Leaving it up to hope is a dangerous and slippery slope that leaves retirees syphoning money from their kids who are struggling to get by while trying to save for their kid’s college funds. Let’s not rely on hope and instead use math and probabilities it will be beneficial to all. 6 The achievable spending rate is the maximum initial shares of wealth that a client can spend while attaining a 90% ‘probability of success’ which measures the likelihood that a retiree will be able to spending according to the plan without exhausting their wealth.